Great job, Jan! Thanks a lot! Your making our life easier and improving opensource community. This should also let OBS work on wayland once they add support for it. 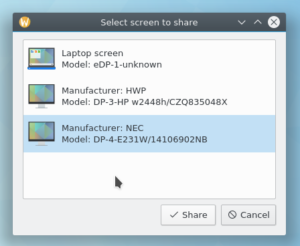 Would desktop sharing possibly also work from SDDM? I mean, in the way that if SDDM is running on a server, one could connect to it, log in, and get the desktop? And ideally, also disconnect from the session and reconnect later on? This unfortunately is not possible, it requires running KWin as wayland compositor (kwin_wayland). Next to screen sharing, e.g. applications like Skype also have the possibility to only share an application window. Is this also supported and in the scope of this project and pipewire? Pipewire doesn’t care about data you stream, you can easily define stream resolution and copy data to stream you need, also xdg-desktop-portal has API for this, there is option when establishing a session, whether you will be streaming window or screen. Problem is getting content of windows from KWin, we get only full screen at this moment, it would be easily possible to copy just content of a window to Pipewire stream if you know coordinations of that window and its size, which is not possible because of Wayland limitations. Will it be possible to share all screens? (e.g. dualscreen setup). Any plans to support sharing only specific windows/applications? Sharing of multiple screens should be possible, I just haven’t look into this yet. For sharing of windows/applications see my comment above. Does it send a buffer of whole Desctop? Or does it send buffers of every layer? It sends buffer of whole desktop. Looking at the screenshot I have to wonder how you would disambiguate screens if you happen to have two monitors of the same model and manufacturer and only want to share one of them (e.g. only the right, non-primary desktop). Maybe some reference to the the current screen configuration, but maybe you already thought of that and it’s just not visible in your example. Currently you will see same monitor twice, there is nothing implemented to distinguish between them. We will need to figure this out. Would it be possible to reuse (parts of) the screen configuration UI? It shows physical arrangement already. The opposite direction would also be nice, i.e. showing a “Shared” emblem in the Screen KCM.